Poliwhirl in game: 1,365 Who? Important notice! Pokemon Poliwhirl is a fictional character of humans. 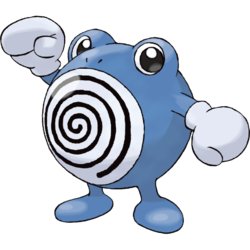 While Poliwhirl is capable of moving on land, it prefers to stay in freshwater ponds and lakes. When out of water, it sweats to keep its skin moist. It is always covered in an oily fluid that allows it to slip away from enemies. All of its skin feels this way except where its swirl is, which is very smooth. The swirl on its belly undulates slowly, and staring at it induces drowsiness. Misty had a Poliwhirl in The Totodile Duel that she caught as a Poliwag; it eventually evolved into a Politoed. Several Poliwhirl were among the Water-type Pokémon feuding with the Grass types in Bulbasaur...the Ambassador. In Tie One On!, Vincent used a Poliwhirl in his battle with Macy. Poliwhirl first appeared in Primeape Goes Bananas. A Poliwhirl appeared in The Battling Eevee Brothers, where it evolved into a Poliwrath. A Poliwhirl was seen in a Pokémon Lab in Riddle Me This. A Poliwhirl appeared in Mewtwo Strikes Back. Multiple Poliwhirl were among the Pokémon seen at Professor Oak's Laboratory in Showdown at the Po-ké Corral. 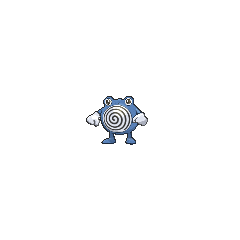 A Poliwhirl under the ownership of an unknown Trainer, appeared in Friends to the End, during the closing ceremonies of the Indigo League. Poliwhirl appeared in Poké Ball Peril. Multiple Poliwhirl also appeared in The Power of One. Two Poliwhirl were part of an exhibition in Flower Power. Four Poliwhirl were among the Pokémon competing in the Fire and Rescue Grand Prix in The Fire-ing Squad!. A Poliwhirl appeared in Beauty and the Breeder where it participated in a Pokémon breeding competition. A Poliwhirl made a brief appearance in Pokémon Double Trouble and Dueling Heroes. A Poliwhirl was among the Pokémon stolen from the Pokémon Center of Blue Point Isle in Around the Whirlpool. A Poliwhirl was under the ownership of a Trainer who was waiting in line to register for the Whirl Cup in Octillery The Outcast. A Poliwhirl was used by one of the students of the Pokémon Trainer's School in Gonna Rule The School!. A Poliwhirl was owned by a family of traveling circus performers in Pokémon Ranger and the Temple of the Sea. Another Poliwhirl appeared in A Faux Oak Finish!. 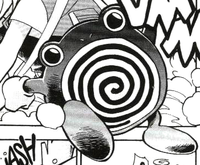 A Trainer's Poliwhirl appeared in SM013, where it participated in the Pancake Race. EP151 Poliwhirl Ash's Pokédex Poliwhirl, the Tadpole Pokémon. 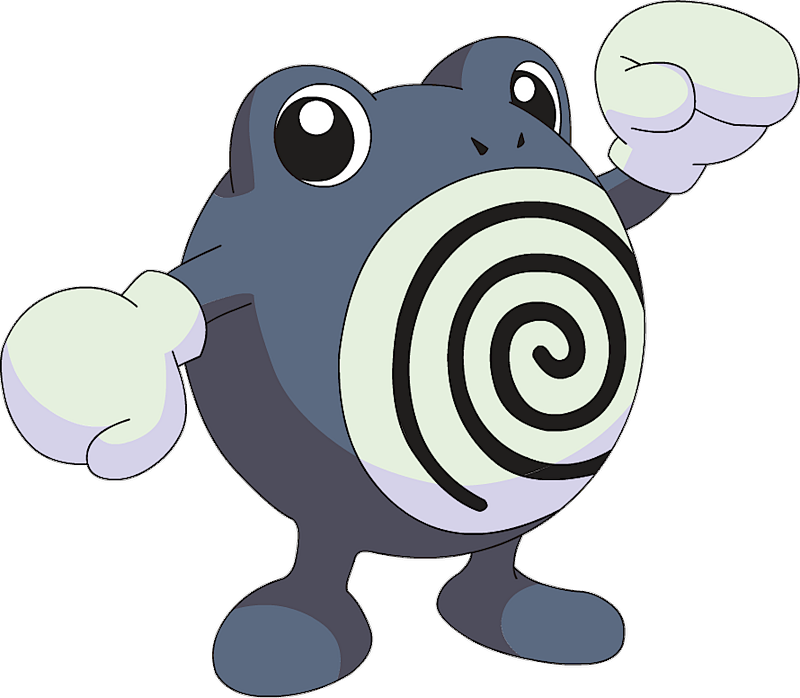 Its highly developed muscles allow Poliwhirl to move efficiently on land, plus it is even more agile in water. Poli was Red's first Pokémon. It debuted in the first round of the Red, Green & Blue chapter, A Glimpse of the Glow as Poliwhirl, however was captured before the start of the chapter as a Poliwag. It gained more importance in Lt. Surge's story arc, in fact it evolved in Buzz Off, Electabuzz! while saving Red from drowning in the sea due to the specks of Water Stone present in the water. Another Poliwhirl appeared in Red's explanation of Pokémon to the children of Pallet Town in A Glimps of the Glow. 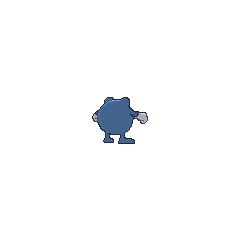 Another Poliwhirl appeared as a silhouette when Green explains about Mew in The Jynx Jinx. Gold's Poliwag, Polibo, evolved into Poliwhirl in Ampharos Amore when Gold and Silver were trapped inside the Tin Tower. With Silver's knowledge of Pokémon trading, Gold temporarily traded Poliwhirl to Silver via their Pokédexes, prompting Poliwhirl to evolve into Politoed when the effects of its King's Rock activated from the trade, triggering the evolution. Another Poliwhirl appeared in The Last Battle XIII as one of the Pokémon sent to help the fight in Ilex Forest. A Poliwhirl appeared in Skirting Around Surskit I as a rental Pokémon that Guile Hideout stole. As of Generation VI, Poliwhirl is the only Pokémon with a branch evolution with unequal base stat totals.